Quinoa is like sprinkles. My husband wholeheartedly disagrees with that statement on the basis of quinoa being gross, and sprinkles not being gross. I don’t mean how they taste though. I know that sprinkles and quinoa are two very different ingredients and that they are not normally found in one recipe. (Thank goodness!) However, every time I cook with either one I end up spilling them all over the kitchen counters and floor. No matter how much I clean I still find some days later. Am I the only one that experiences this? Anyway, I’ve been on a quinoa kick lately and this salad is my newest love. Gosh, green food is hard to make look appetizing, especially when it’s cloudy out, but you have to believe me when I say that this salad is seriously delicious. It’s loaded with a lot of great flavor from the pesto sauce and seasoned veggies. No bland and boring going on here. I cooked the vegetables on the stove top, but you can also roast them in the oven or even on the grill if that’s seasonally appropriate for you. I made this ahead of time to eat for lunch at work and I’ve eaten it hot, cold, and room temperature, all of which are fabulous. 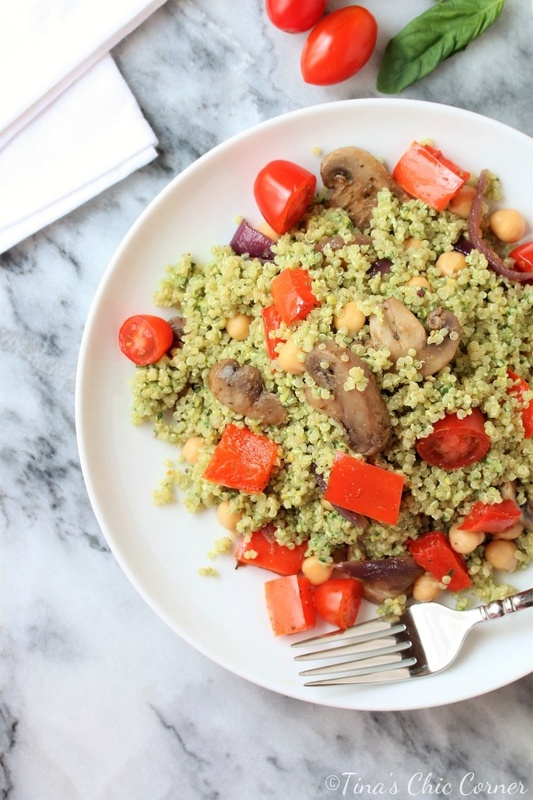 I’m kind of on a vegetarian kick too right now so I love that I’m getting protein from the quinoa and chickpeas. In a food processor, add the basil leaves, lemon juice, water, garlic, pistachios, parmesan cheese, and salt, and process until it’s smooth. Note that there is only a little bit so you will need to scrape down the sides of the food processor a few times in between processing. Prepare the quinoa according to the directions on the package and then set it aside. In a large skillet, over Medium heat, add the oil, sliced red onions, chopped bell peppers, and sliced mushrooms. Season the vegetables with garlic powder, oregano, and salt, then mix everything together. Cook until the vegetables are tender and they aren’t super wet anymore. 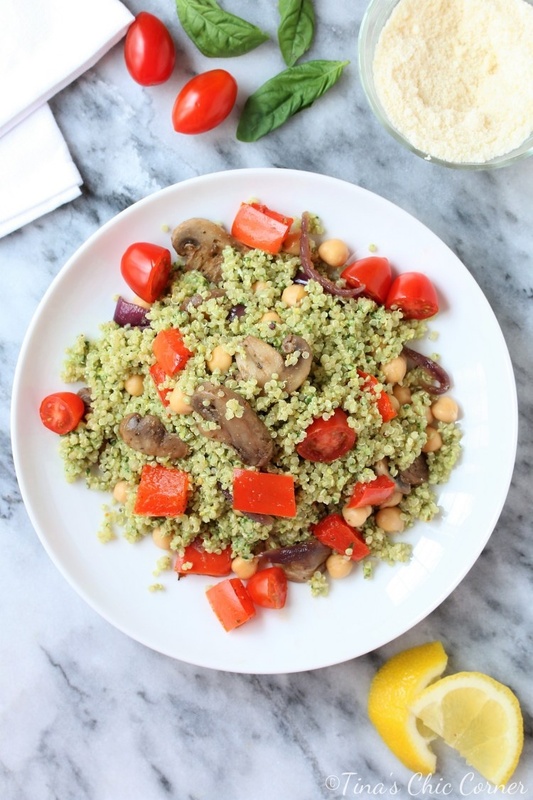 In a large bowl, add the cooked quinoa and pesto and mix together. Add the cooked vegetables, chickpeas, and grape tomatoes and gently mix everything together.